Eggy Portable Mini Speakers Come From My Fantasy Chicken | OhGizmo! Somewhere in South Korea lives a chicken. This chicken lays eggs that are, in fact, reasonably attractive and potentially useful computer peripherals. Break one open (the two halves are joined by magnets) and inside you will find 4 watts of yolk-y audio goodness with a built-in digital amplifier. Designed for things like PMPs and Netbooks, the Eggy speakers are USB powered, and while the picture makes them look seamless and slick, the USB wire and audio-in wire and the wire that connects the left and right speakers are sure to make a mess of things, and I also have no idea where the little speaker stands come from. So, the concept is pretty cool, but in real life things may look a bit different. S&J Co. has the right idea here: instead of designing electronics, just wait for some freak of nature to design them for you… If you have an infinite amount of chickens laying an infinite amount of eggs, you’re pretty much guaranteed that one of those eggs will be a pair of speakers (or anything else you want, for that matter). I’m sure S&J Co. doesn’t actually have an infinite amount of chickens (an infinite amount of anything presenting some significant logistical challenges), but that doesn’t preclude them from getting lucky with a finite amount of chickens, which is obviously what happened. 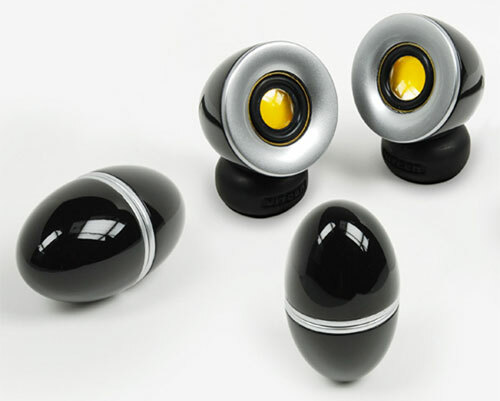 The Eggy speaker will be putting on an appearance at CES 2010, and if S&J Co. picks up some distribution channels, we should all feel very sorry for their poor mutant chicken. Now these are super cool. I'd like to see the robot chicken that laid these. Hmm, Robot Chicken. That would be a good name for a TV show. These are super cute and easy to store and take anywhere. I'd buy a few for me and friends.